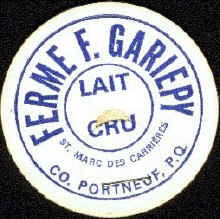 At the beginning of the 40's, Mr. Maurice Gariepy began to deliver milk from its own herd of approximately 12 cows. A few years later, his son Fernand, replaced him. The deliveries were made exclusively in the St-Marc-des-Carrières area. Milk was initially delivered in a "buggy". Then, in the 50's, a horse-drawn closed cariage was used. At the beginning, Mr. Gariepy delivered 20 to 25 quarts a day which was sold approximately 12 cents. At that time, the delivery was made 7 days a week because people did not have refrigerator to cool their milk. Fernand offered this service until 1968. The washing of the bottles was carried out by the sisters of Mr. Gariepy and his wife, Jeannine Rivard, which he married in 1953. Fernand give up the milk route business in 1972 but he continued to work on the farm until 1988. 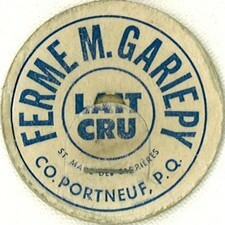 Source: Fernand Gariepy via his daughter, France Gariepy.